[194 Pages Report] The market for heat-treated steel plates was valued at USD 99.59 Billion in 2016, and is projected to reach USD 121.77 Billion by 2022, at a CAGR of 3.53% from 2017. The report aims at estimating the market size and future growth potential of the heat-treated steel plates market across different segments such as steel type, treatment, application, and region. The other objectives include providing detailed information regarding the main factors influencing the growth of the market (drivers, restraints, opportunities, and industry-specific challenges). It also aims to study the individual growth trends, future prospects, and contribution of various segments to the total market. The study also analyzes opportunities in the market for stakeholders and details of the competitive landscape for the market leaders. The study strategically profiles key players and comprehensively analyzes their core competencies. The market ecosystem includes various stakeholders involved in the supply chain of the heat-treated steel plates industry starting from raw materials suppliers, research & development, and manufacturing. Post this, the marketing and sales of the products take place, which is only possible if an efficient distribution channel is developed. Finally, the end products are made available to the consumers. The global market for the heat-treated steel plates market is dominated by players such as ArcelorMittal (Luxembourg), Thyssenkrupp AG (Germany), POSCO (South Korea), TATA Steel (India), Baosteel (China), Outokumpu (Finland), JFE Holdings (Japan), Nippon Steel & Sumitomo Metal Corporation (Japan), Novolipetsk Steel (Russia), and Essar Steel (India). MarketsandMarkets projects that the heat-treated steel plates market will grow from USD 102.36 Billion in 2017 to USD 121.77 Billion by 2022, at an estimated CAGR of 3.53%. Rise in building & construction activities, large-scale investments in infrastructure & industrial sectors, and rapid urbanization in developing economies are boosting the growth of the heat-treated steel plates market. The construction segment is projected to account for the largest market share and dominate the market from 2017 to 2022. 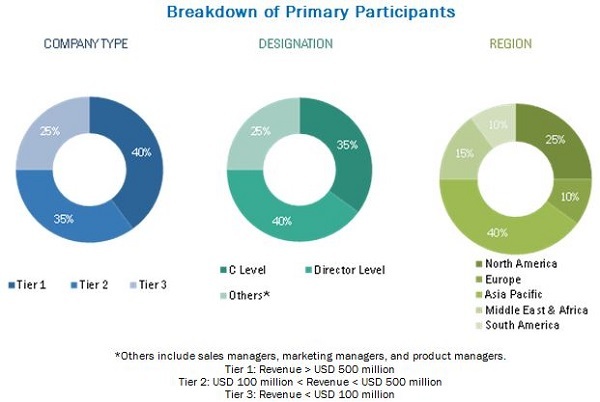 The growth in adoption and development of industrial machinery plays a key role in changing the market; this segment is projected to grow at the second-highest rate during the forecast period. The segmentation for this report is based on steel type, treatment, application, and region. The energy & power segment is projected to be the fastest-growing segment in the heat-treated steel plates market during the forecast period. There are various heat-treated steel plates used in major boilers, pressure vessels, storage tanks, and other structural parts in the energy & power sector. The power sector requires these plates to withstand adverse conditions, such as high pressure and high temperature. Heat-treated steel plates are used in construction, energy & power, industrial machinery, automotive & defense vehicles, and shipbuilding. The global market, in terms of application, was dominated by the construction industry in 2016. The rise in disposable incomes of the urban population is leading to the construction of new houses in urban regions, thereby giving rise to an increased demand for heat-treated steel plates. Growth in construction expenditures in the non-residential sector will continue to support the demand for heat-treated steel plates. The carbon steel type segment dominated the market in 2016, and is projected to be the fastest-growing application in the next five years, as a result of its economical price, easy availability, and wide application areas in manufacturing and construction industries. Asia Pacific dominated the market for heat-treated steel plates in 2016. China contributes a major market share in the Asia Pacific market. Easy availability of raw materials and cheap labor, coupled with significant domestic demand, makes this market very attractive for industry participants. The growth in middle-class population and the rise in the standards of living of the population are expected to drive the demand for heat-treated steel plates due to the rise in demand for steel across various industries. The market in this region is growing rapidly due to the presence of numerous leading players. In 2017, Asia Pacific is estimated as the largest consumer of heat-treated steel plates, with China, India, Japan, South Korea, and Australia being the major markets. 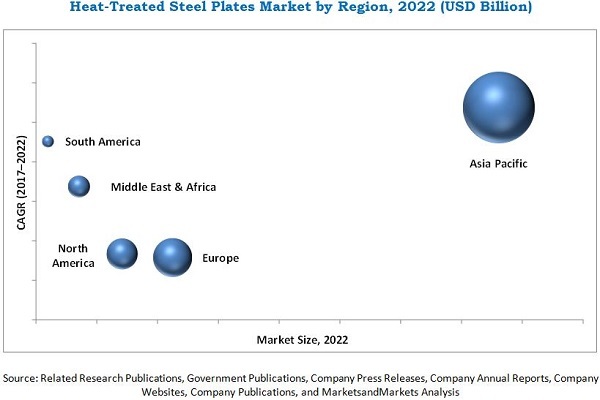 The Asia Pacific heat-treated steel plates market is projected to register the highest CAGR during the forecast period. The growth of the building & construction industry and economic development in the region have led to the increase in demand for heat-treated steel plates. Volatile raw material prices and excess supply of steel in some regions pose a challenge to the growth of the heat-treated steel plates market. The global heat-treated steel plates market is dominated by players such as ArcelorMittal (Luxembourg), Thyssenkrupp AG (Germany), POSCO (South Korea), TATA Steel (India), Baosteel (China), Outokumpu (Finland), JFE Holdings (Japan), Nippon Steel & Sumitomo Metal Corporation (Japan), Novolipetsk Steel (Russia), and Essar Steel (India). These players majorly adopted strategies, such as expansions and agreements to meet the demand.